Last year's big run from John O'Groats to Lands End raised over £34,000 for St. Benedict's Hospice. 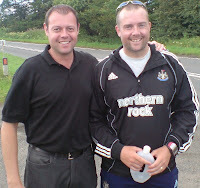 Just a month before I set off on that epic, a group of Northern Rock staff, headed by Mark Fleming (pictured on the left with me on day 10), did a bike ride in Northumberland and raised £47,000 for The Northern Brainwave Appeal!!!! I'm sure you'll agree that the amount raised is astonishing and might I say fully deserved! Now the thing is, Mark has been reminding me of this fact on an almost daily basis. To say the words "Charity" and "Hero" are commonplace in our office is a massive understatement. It's all good banter though. However, the fact remains that I got upstaged last year in the fundraising stakes. Not one to rest on his laurels he decided to go one better at the derby match last weekend. He decided to upstage my lap of honour at the Aston Villa match when his mate Jan won a hospitality package in a competition. After a tour of the ground he met Peter Beardsley, then had a cuppa with Kevin Keegan and Terry Mac in the manager's office. 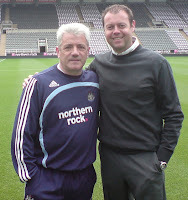 Then a pre match meal followed with Sir Bobby, Chris Mort, Mike Ashley, Niall Quinn and Bob Murray (!!!!). 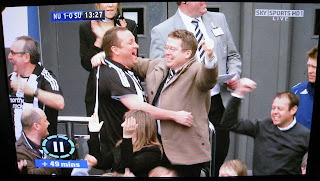 His seat for the match was right in front of Chris Mort and Mike Ashley and he was subsequently seen by millions on Sky TV celebrating the first goal (pictured). His (and all of our) day was complete when we stuffed the sad mackems 2 - 0. Ever since Sunday, people have been listening in total amazement as to how Mark and his friends were treated by the club. Once again, they've scored big time in the PR stakes; treating a bunch of working class lads to a quite remarkable day. And a day, I'm sure, they'll never forget. And one Mark will undoubtedly never let us forget! I dread to think how he is going to upstage my run across the USA in 2011! In the Summer of 2005, I would often wake up in a cold sweat during the night having dreamt of running the length of the UK from John O'Groats to Lands End. Admittedly, the route was often lined with bikini clad babes but the point is that I started to subconsciously plan and prepare for the biggest challenge of my life. 3 years on and a similar thing has started to happen. I've started to dream about running the 3100 miles from the west coast to the east coast of the USA (30 miles per day with a rest day after every 14!!! 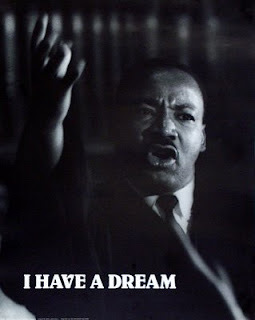 The dreams are quite vivid!! No sign of any American totty just yet mind!). At the time of writing I reckon there is about a 5% chance of success. So many things have to be in place, so many things have to be in my favour. I am determined to give it my best shot though. 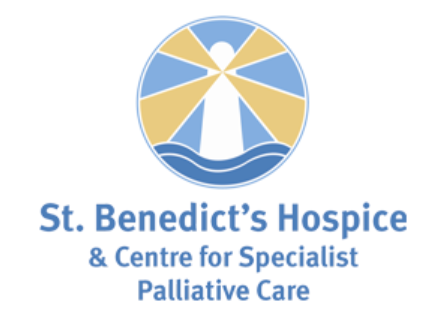 It would be great to hand over one last sizeable cheque to St Benedict's Hospice (and whatever other charity is chosen) in 2011. In the meantime, I'm continuing to run and run as much as I can. I'll be building up the miles over the coming months, especially in the North Pennines. Also, while I still have a job there, I'll be continuing to enjoy the classes in the Northern Rock gym (Spinning, Boxercise and maybe one day Body Pump (whatever that is!)). I've been doing 5 or 6 classes a week for the last 7 weeks. After so many lonely miles on the road, it's refreshing to take part in a class with other people. I must say that the instructors are very good too (Andy, Paul, Matt, Steve and Tracy). I could do with one or two of them in the USA in 2011! Meanwhile, I do hope those dreams of running such a distance continue for sometime yet. And if a few Daisy Duke lookalikes want to make an appearance then that would be just fine. A cold, windy, wet and miserable 7.8 miles. 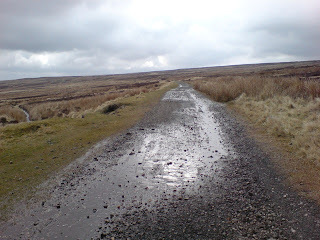 It was very cold, wet, windy and miserable on Waskerley Way today as I reacquainted myself with the Northern Pennines. The last time I was on this route was on day 16 of the Big Run last year. Thankfully, the shin pain I was experiencing back then is long gone. The run started off quite slowly and due to the wind (and probably Friday's Prawn Madras!) I never managed to post a sub 10 minute mile with an average 10:36 today. Oh well. At least it's a start. In contrast, I managed an average 09:17 per mile over 8.4 miles last Wednesday in near perfect running conditions. 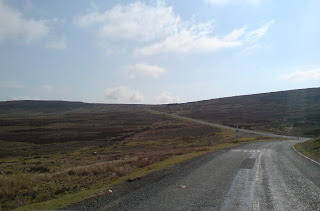 I plan to spend the next 9 weekends doing different variations of the Pennine Challenge route. I do hope that the weather gets better! As I've said many times, there is no more miserable a place on this planet than Waskerley Way when the weather is bad. ...training in the Pennines that is!!! After 6 weeks of cross training (see below), tomorrow will see me tackle the tried and tested route from Castleside to Stanhope Ford. The weather forecast is quite good so it should prove a pleasant little 11 mile run out. 2008 event confirmed - AT LAST! After much negotiation and deliberating, I've finally managed to put together a team to tackle what I think is a very difficult and challenging event. The original plan was to run 84 miles in 3 days over the Hadrian's Wall path. The logistics of organising this run / cycle ride have proved very difficult and I don't think we yet have the experience in the team to tackle such an event over 3 days. That's not to say it won't be done in the future! This year, June 29th will see a mixed team run and cycle the PENNINE CHALLENGE route undertaken by 15 Northern Rock staff last year. All funds raised will be in aid of The Children's Foundation. This gruelling 22 mile run claimed the running career's of 2 participants last year. It can't be overstated, just how difficult this course is! It has been carefully selected for difficulty and should, once again, prove quite a test. It's certainly worthy of sponsorship! Starting at Castleside in County Durham, the first 10 miles are on the C2C route, ending with a difficult 17% downhill drop into Stanhope. This alone should be enough to sap the energy of any decent runner. However, the nightmare is just about to start! Once the ford in Stanhope has been navigated (let's hope the tide is out! ), it's a sheer 17% climb for 1 mile. This will leave the runner gasping for air and heart rates in even the fittest runner's anaerobic zone. The gradient lessens slightly (not by much!) for the next 2 miles and eventually a nice 1 mile downhill stretch is reached. Once into the valley, the morale of the runner should be pushed to the limits as a 3 mile climb up to 1650 ft will now be clearly visible. This climb, at any time is difficult, however it should prove quite a test considering it runs from mile 13 - 16 on the route. Imagine doing a hilly Great North Run, then having to run 3 miles up hill to 1650 ft. I'm sure you get the idea! Once the summit has been reached the runner will think it's Christmas when they see that the next 2.5 miles are all downhill. The valley at the end of this descent is the start of the final climb on the run. Compared to the other climbs, it's fairly easy. It's just as well as this will take the runner to an impressive mile 21 on the route and the upper outskirts of Middleton in Teesdale. 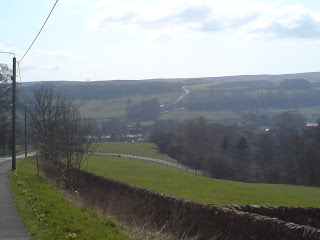 The final glorious mile down into Middleton in Teesdale should be straightforward. Hopefully, the runners will have enough energy left for a decent finish and will not look too ill in front of the tourists. So, there are 2 things you should know about the Pennine Challenge. 1 - It's in the Pennines and 2 - it almost certainly is a challenge!